World Congress on Neonatology and Pediatrics: Get to know about Cystic Hygroma!! Get to know about Cystic Hygroma!! Cystic hygromas are fluid-filled sacs that occur mostly on the head or neck of a baby as a result of blockages in the lymphatic system. It can be detected using ultrasounds during pregnancy and can also be diagnosed after the baby is born. It affect 1 in 800 pregnancies and 1 in 8,000 live births. In 80% of cases, cystic hygromas appear on the face, including the head, neck, mouth, cheek, or tongue & the growths can also occur in other areas of the body, including the armpits, chest, legs, buttocks, and groin. Cystic hygromas causes are unknown, but genetic abnormalities are present in about 25% to 75% of affected children & the disease is more common in individuals with Down Syndrome. 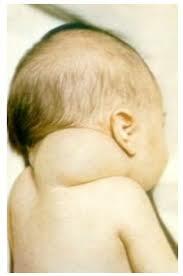 Cystic hygromas that are present at birth or develop after birth are usually benign, meaning they are not harmful. Symptoms and signs vary with the location of the cluster of cysts and include the appearance of cluster of cysts that are sometimes visible with the naked eye and may cause breathing difficulties, feeding problems, sleep apnea, & failure to thrive. Some additional tests to diagnose Cystic Hygroma includes Transvaginal ultrasound, Fast Spin Magnetic Resonance Imaging, Amniocentesis, etc. It might not need treatment if it is not causing any problems. Usually cystic hygromas are diagnosed when the fetus is still in the womb, often during a routine abdominal ultrasound and may also detect it during a blood test carried out at 15 to 20 weeks & if the blood test shows high levels of alpha-fetoproteins, it might include a possible cystic hygroma.